Wigan owner Dave Whelan has lashed out at the English FA after Wayne Rooney escaped punishment for his elbow on James McCarthy. 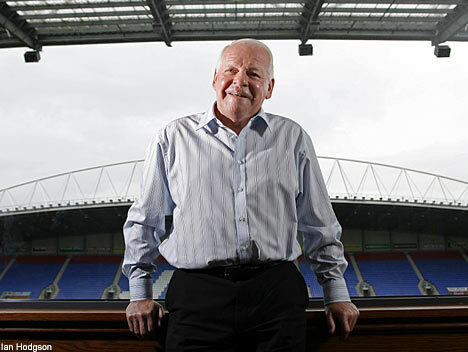 Whelan has accused the Premier League of bias towards United after Rooney got away with the elbow during Saturday’s 4-0 win for his team at the DW Stadium. Referee Mark Clattenburg awarded a free-kick against Rooney at the time and no further action will be taken against the player whose elbow was caught by the TV cameras. Whelan told The Sun: “It sends out a terrible message. Something is wrong when a top international like Rooney is seen doing something like this, as clear as day, and is allowed to get away without being punished. “If it was any other club or player, you can bet your life he would have been sent off. But officials seem intimidated by the words Rooney and United. “Manchester United are allowed to get away with things the rest of us get pulled up for. And you can’t have one set of rules for one club and another for the rest. “I don’t care what the FA say about the matter being dealt with at the time by us getting a free-kick. They, and everyone else in football, know justice isn’t being served here. Chelsea boss Carlo Ancelotti has confirmed his club will not sack Ashley Cole over the air gun incident that has dominated newspaper headlines in England. Cole accidentally shot a work placement student with the air gun at the Chelsea training ground last week. The story only came to light in last Sunday’s News of the World which revealed that 21-year-old Tom Cowan was treated by club medical staff for a wound to his side. Police are in talks with the club to ascertain if any criminal offence took place but Chelsea are adamant the issue has been dealt with and Cole will not face any further action. 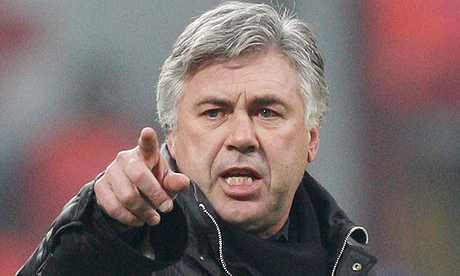 “There is no way we would have considered sacking Ashley Cole over this incident,” said Ancelotti. “He always had very good behavior here. Now, we have to move on. Who didn’t make a mistake in his life? “The mistake was that the gun was here in Cobham. We didn’t know the gun was here. “I have spoken with him. He was very disappointed with this, and said sorry. It was an accident. We have taken proper action. Ancelotti also denied that the incident was proof of a lack of discipline or too much player power within the Chelsea dressing room. “They have no power,” said the Blues boss. The training ground at Cobham is not out of control. At Cobham, there is discipline. Brazil ace Kaka is on the way to the Premier League with Chelsea or Manchester City his likely destination after Real Madrid confirmed they will sell him in the summer. Tottenham are back in for Manchester City centre-back Micah Richards who is also attracting interest from Manchester United. United have again been linked with Borussia Dortmund’s Serbian defender Neven Subotic. Liverpool want to take Barcelona striker Bojan Krkic on a season-long loan deal in August. Bayern Munich have pulled out of the race for Ajax right-back Gregory van der Wiel who will sign for Manchester City or Juventus at the end of the season. Defender Roger Johnson wants to sign a new deal with Carling Cup winners Birmingham despite interest from Liverpool, Spurs and Manchester United. Tottenham have turned down a bid from Paris St Germain for defender Younes Kaboul. Russian side Rubin Kazan say they want Birmingham’s Carling Cup winner Obafemi Martins back when his loan deal expires in May. Manchester City striker Felipe Caicedo, currently on loan at Spanish side Levante, could end up at Lokomotiv Moscow next season. Leeds United have offered to take Aston Villa’s young Scottish midfielder Barry Bannan on loan to boost promotion bid. Charlton have opened talks to take West Ham striker Benni McCarthy on loan. French striker Thierry Henry says he wants to work with Arsenal again in any capacity when his contract with the New York bulls expires. Arsenal defender Thomas Vermaelen has suffered another setback in his bid to beat an ankle injury. West Brom defender Jonas Olsson is in trouble after smashing a framed photograph in the tunnel at the Britannia Stadium after his team’s 1-1 draw with Stoke on Monday night. Tottenham striker Jermain Defoe will be available to play against Wolves on Sunday despite injuring an ankle during a training camp in Dubai over the weekend. Birmingham have told Carling Cup winner Lee Bowyer he will not be offered a new contract this summer. Aston Villa midfielder Robert Pires wants to extend his stay with the club next season.